The man who set in motion Laos’s scheme for a railway, to connect the capital, Vientiane, to China’s Yunnan, was handed down a suspended death sentence in July. But the conviction of an ex-railway minister in China is not the end of South-East Asia’s most ambitious railway project. Digging tunnels through the geologically unstable limestone mountains of northern Laos is still China’s best and only bet for a route to the Gulf of Thailand. It has already secured access to the Indian Ocean, both by road and by a pipeline that should pump 10% of China’s total oil requirement upcountry to Kunming from the port city of Kyaukpyu in Myanmar. Success has been proved elusive further up the coast, where South-East Asia and South Asia meet. A proposed road and rail link, connecting Kunming to the Bangladeshi port of Chittagong via Myanmar, is a non-starter. Myanmar has erected a high-security fence to keep a persecuted minority, the Rohingya, from crossing the border; it blocks the way for all. And the way due south, through Vietnam, is closed. 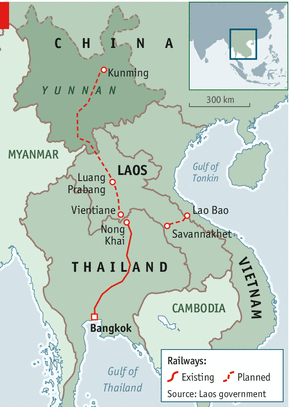 The Vietnamese, who are still the biggest investors in Laos, have a project of their own to the east—a $5 billion high-speed railway, cutting through Laos’ central Savannakhet province to Thailand. They cannot be expected to take kindly to any Chinese proposal to laying tracks through their territory. The World Bank and the Asian Development Bank (ADB) are often regarded as cheerleaders of economic integration by means of capital-intensive physical infrastructure. But even they have warned of the massive debt the project would require. At one point China had offered to pay for the project outright. It decided instead that it would rather see the work done through a loan—perhaps in order to avoid looking like an overbearing influence in the affairs of one of its smallest neighbours. A problem of perhaps greater consequence than the debt burden itself is that the loan will probably be repaid by ceding additional mining concessions—potentially speeding up the extraction of natural resources in a country where economic rents have a habit of accruing to well-placed insiders. For Laos to undertake such an enormous loan denominated in China’s currency might even be enough to persuade the country to peg its currency to the yuan. Tristan Knowles, the director of Economists at Large, an Australian consultancy, calculates that a (modest) 10% appreciation of the yuan against the Laos kip could increase the burden of such a loan by 3.8 billion yuan ($620m) in a very short time. No matter. The question is not whether the railway will be built but instead how. For instance, how wide a corridor it will need—10m, 500m or 5km, depending on the demands of the mountainous territory—is something nobody yet knows. The bigger number would leave enough room for a China-controlled corridor plus an access road through to the Thai border. A man who has seen the blueprint says the final stop of the proposed railway is smack in the middle of a new Chinatown, to be built to the east of Vientiane, housing more than 100,000 Chinese. That is the long game. In the short run, China and Thailand are focusing on linking their markets via Laos either where the country it narrowest, or, say, east of the opium-growing Golden Triangle, where Thailand and Laos meet Myanmar. It is in fact a century-old route of Yunnanese trade with the Thai cities of Chiang Rai and Chiang Mai. In December the newest of four “Thai-Laos Friendship Bridges” spanning the Mekong river is to be inaugurated at Huay Xai. The bridge, paid for by China and Thailand, is meant to cut travel time on the planned 1,900km (1,200 miles) Kunming-Bangkok Expressway. The scale of the longer-term railway project can seem daunting. The Chinese are looking for reassurances from Thailand’s government that it will do its bit, so that China does not lay tracks to Vientiane in vain. Thailand’s government intends to spend about 2 trillion baht ($64 billion) to upgrade the country’s infrastructure, including its railways, by 2020. The Chinese probably needn’t worry about the spending priorities of the current government, which is headed by Yingluck Shinawatra. The route from Vientiane runs right through Thailand’s north-east, which is the political base of Ms Yingluck’s family. Its provinces have come to determine who governs from Bangkok, the train’s final stop.